At thirty-nine, Nancy Kissel had it all: glamour, gusto, garishly flaunted wealth, and the royal lifestyle of the expatriate wife. Not to mention three young children and what a friend described as the best marriage in the universe. That marriage,to Merrill Lynch and former Goldman Sachs investment banker Robert Kissel, ended abruptly one November night in 2003 in the bedroom of their luxury apartment high above Hong Kong's glittering Victoria Harbour. Hong Kong prosecutors, who charged Nancy with murder, said she wanted to inherit Rob's millions and start a new life with a blue-collar lover who lived in a New Hampshire trailer park. She said she'd killed in self-defense while fighting for her life against an abusive, cocaine-addicted husband who had forced her for years to submit to his brutal sexual demands. Her 2005 trial, lasting for months and rich in lurid detail, captivated Hong Kong's expatriate community and attracted attention worldwide. 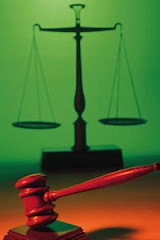 Less than a year after the jury of seven Chinese citizens returned its unexpected verdict, Rob's brother, Andrew, a Connecticut real estate tycoon facing prison for fraud and embezzlement, was also found dead: stabbed in the back in the basement of his multimillion-dollar Greenwich mansion by person or persons unknown. 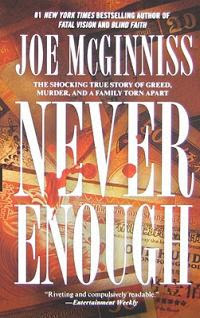 Never Enough is the harrowing true story of these two brothers, Robert and Andrew Kissel, who grew up wanting to own the world but instead wound up murdered half a world apart; and of Nancy Kissel, a riddle wrapped inside an enigma, a modern American woman for whom having it all might not have been enough. I remember getting the book Fatal Vision and thinking because there was no picture on the cover that I had ordered,by mistake,a fiction crime book.I checked the back again and I was still convinced it was fiction.I started reading and only quite a way through was I completely convinced that this was indeed a true crime book when the dates started coming out.The reason I mention this is because true crime books written by Joe McGinniss read like novels,and Never Enough is another great book by Joe McGinniss.This book is about the Kissell family,the central characters being the father,and the two sons,Robert and Andrew.The book details their early lives and subsequent marriages.Then into their careers,where one son seemingly chooses the righteous path (by society's standards anyway,considering Robert made money off floundering businesses by buying them and then re selling for a profit) while Andrew although fronted as a real estate investor found every way to scam and con his partners in whichever deal he had currently going. Their marriages and relationship dynamics within this family is expertly woven into this true crime story resulting in a family saga extraordinaire,to rival any fictional family saga I have ever read.While I am personally very irritated with excessive filler details who provide no extra value to a book,I do however expect it in books which are longer than usual and I do make certain allowances for those.This book at 370 odd pages hardly falls under the description of "short" and I can honestly say has absolutely not one bit of unnecessary information.Everything is there to be devoured and enjoyed.Joe McGinniss is brilliant and I am now going to order his other books,Blind Faith and Cruel Doubt so watch out for those reviews.Joe McGinniss has now joined the ranks of true crime writers whose books I buy just because they wrote it,the actual story being a secondary deciding factor. I highly recommend reading this book as I do Fatal Vision (I still have to do a review for Fatal Vision-too little time/too many books to read). Honestly now,is there a tiny little part of you that feels good if it turns out a person who was extremely wealthy turned out to be actually living a miserable life or do you think that all rich people are actually living miserable lives? That was an excellent answer and very diplomatic.I wanted to add above "and to all my rich followers please don't un-follow me".I think people who would be happy with rich people being miserable would probably be miserable poor people.I have always wondered how very poor people manage and get by and then have wondered in the same breath if very rich people look at my life and wonder how I manage and get along.Knowing how happy I actually am (most of the time) makes me think that probably very poor people are also ok.
Nicole this book was so good.I went to check out Cruel Doubt and Blind Faith and they are NOT available on Kindle.I am so disappointed.I am going to have to order from my online store and those take 10 working days for delivery.Blind Vision is still the best book but this one was a very close second.I want to read all Joe McGinniss' true crime books.At this stage I will even read his fiction crime books. Ok, so I have read Fatal Vision many times, as well as Blind Faith and Cruel Doubt. All of these have been made into TV movies. They are all AMAZING books. Well worth the purchase even if they are not on Kindle. Hmmm! What a coincidence. I actually recently saw a C&I show about Andrew's story where they briefly mention Rob's murder. That is crazy.